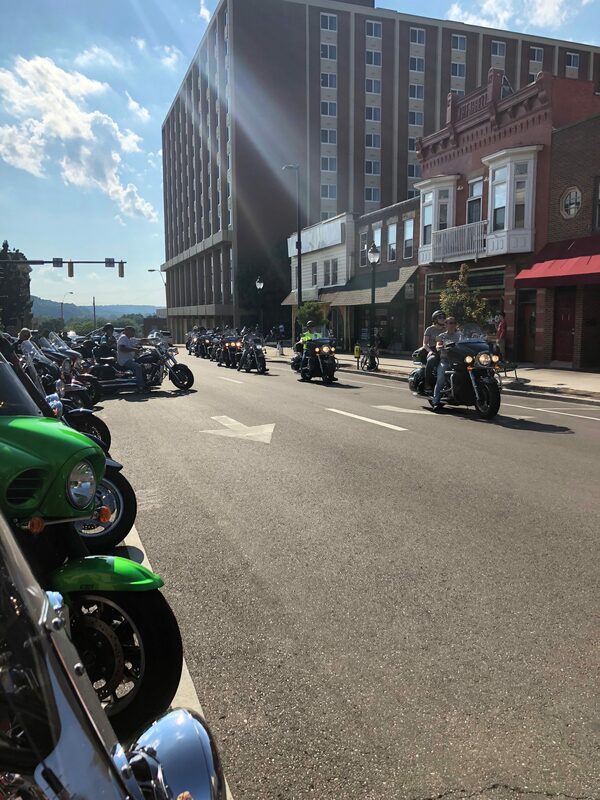 ATHENS — Members of the 200 expected motorcyclists who are visiting Athens this week from the Vulcan Riders Association hit the road Monday night through uptown Athens. They made their way from the OU Inn up through Richland and Court Street and finished by parking along West Union before shuffling into Jackie O’s for a bite to eat. A view from the back of a Vulcan Rider’s bike driving through Court Street. This national rally takes place every year in a different town in the US. This year, riders came from Illinois, Florida, Colorado, Canada, and one member all the way from England. Patrick Shanon, a Columbus resident who is the president of the Central Ohio regional chapter, said bringing the VRA to Athens has been two years in the making. He decided to nominate Southern Ohio two years ago after the annual rally, and last year Athens was chosen at the rally in North Carolina. Shanon, born and raised in Ohio, said he was excited to “show off” his state. You can hear more about why and how Shanon chose Athens as this year’s rally destination at this link. The Windy 9 is a series of scenic biking and riding routes throughout Southeastern Ohio. The group will take on three of them, along with driving through Nelsonville and visiting a motorcycle shop in Columbus. When the group isn’t exploring parts of the Windy 9 they will be raising money through a 50/50 raffle, a silent auction and other fundraising events for the charity Dogs4Warriors. This organization trains dogs to take care of veterans who are suffering from Post-Traumatic Stress Disorder or have other needs. “It’s totally free for the veterans and it’s an awesome cause and we love being able to help them out,” Shanon said. Shanon said along with choosing a charity to support every year, the VRA aims to support the local communities they visit by eating at local restaurants, supporting local shops, and traveling the scenic routes the town has to offer. Next year’s rally location will be announced at the banquet dinner this Thursday where more donations will be made to Dogs4Warriors. After the dinner all members will return to their homes across the country being able to say they experienced the unique beauty and charm of Athens and Southeastern Ohio.